Tolfe apartment is located in a former farmhouse. It has been completely renovated with brick ceilings and wood beams and furnished with antique furniture. The apartment is situated in the white villa, together with the Lunghe apartment. There is a spacious garden with linden trees, cypresses, oaks and conifers out front. 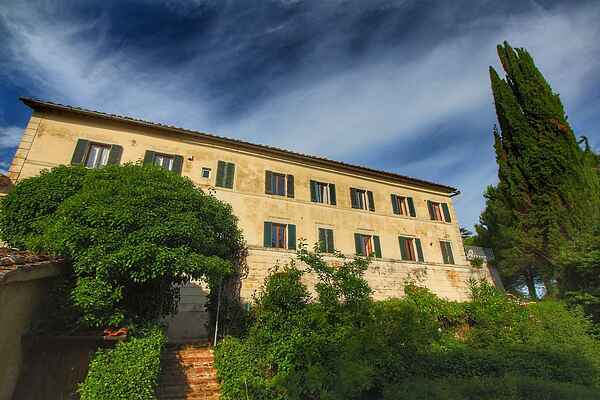 The swimming pool is in a wonderful panoramic setting among the olive trees and has a picturesque view of Siena. The apartment is situated above a hill in the little village of Tolfe, just 3 km from Siena. The location in the heart of Tuscany means that coastal cities such as Florence, Arezzo, Pisa, Lucca and Perugia are just about an hour's drive away. The owner lives in the brick farmhouse next to the white villa and is always glad to give tips about exploring the region. The pool is shared with 2 other apartments.